A look under the hood shows that the N8800 means business. 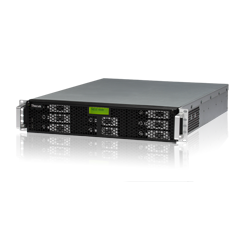 Equipped with eight 3.5" SATA hard disk bays, the N8800 offers massive storage capacity in a 2U rack mount form factor. This combination brings a powerful yet cost-effective network attached storage solution that is perfect for medium-to-large organizations. The N8800 supports iSCSI initiators, which allows servers to access it as a direct-attached-storage device over LAN or Internet with excellent transfer speeds. With this capability, users can centrally manage and deploy storage for their entire network. In addition, the N8800 is also stackable, enabling users to connect their unit with up to five additional N8800s and manage them via a master system. With iSCSI and stackability, expanding the capacity of application servers is both quick and easy. 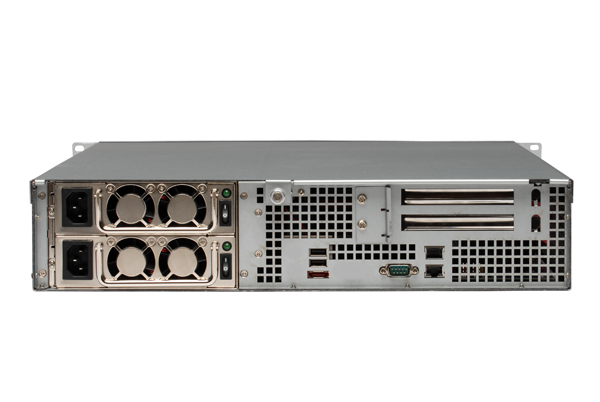 Equipped with PCI-e interface, the N8800 provides even faster response and more concurrent connections. Also, with built-in compatibility with external modules, the N8800 can execute and run multiple applications at the same time, allowing it to handle a whole lot more than mere file storage. 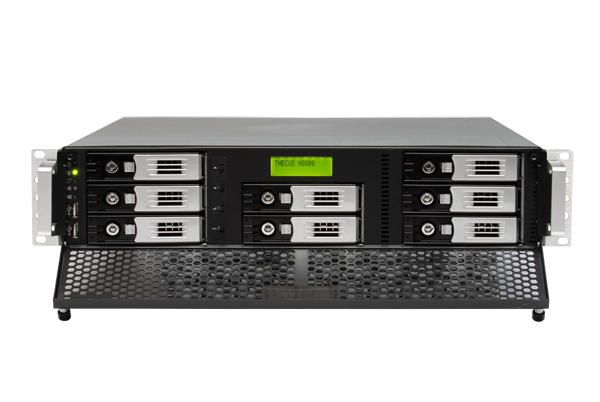 Need to change the RAID level or add more storage capacity to the N8800? 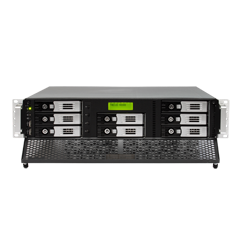 The N8800 features RAID capacity expansion and RAID level migration, which means that users can add larger hard disks to available slots and join an existing RAID volume. To meet upcoming standards and ensure maximum compatibility and flexibility, the N8800 offers support for ext3 and ZFS file systems. Users can select the system that they require and create the needed capacity for different applications. Never has there been a NAS unit this powerful and flexible. The N8800 is also equipped with Nsync, Thecus' remote data backup application. With Nsync, users can have the N8800 automatically upload files to an external storage device at a designated time. The N8800 is also capable version control via a snapshot function with the ZFS file system, allowing users to efficiently create and restore remote backups. For users, the result is total data security and peace of mind. 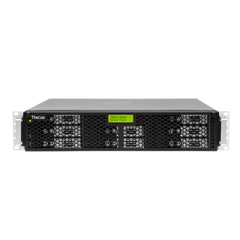 The 1U4500 from Thecus® shook the world of rackmount storage by bringing fast and affordable SATA storage to a 1U form factor. 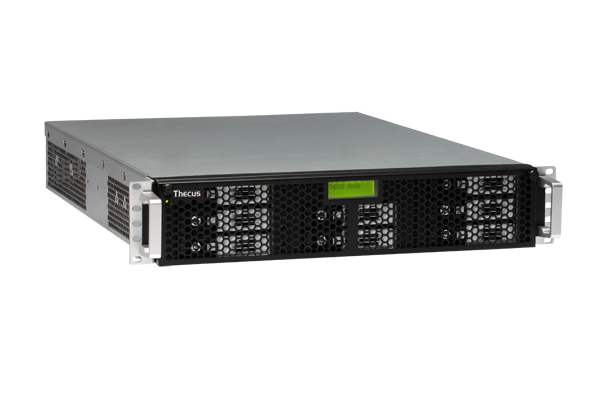 Today, Thecus® is pleased to release its latest rackmount NAS device, the N8800. Offering massive storage capacity, advanced features, and blazingly-fast performance in a 2U unit, the N8800 is poised to be the favorite NAS device for IT departments everywhere. The N8800 delivers the performance and capacity that businesses demand. Under the hood is an Intel® Celeron™ processor and 1GB of DDR2 memory for snappy performance, faster response, and more concurrent connections. Another highlight is the N8800's eight SATA hard disk bays, which enable up to 8 terabytes of storage. 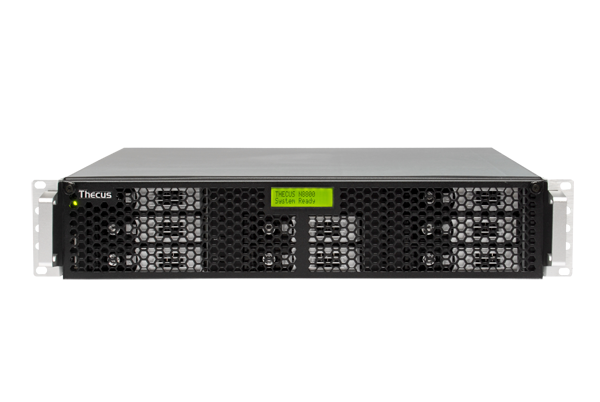 If more capacity is required, the N8800 is also stackable, enabling users to connect their unit with up to five additional N8800s and manage them via a master system. 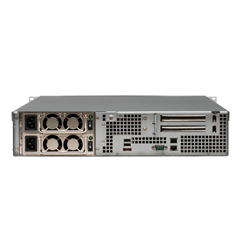 What's more, the N8800 supports iSCSI initiators, allowing IT departments to centrally manage and deploy storage for the entire network. 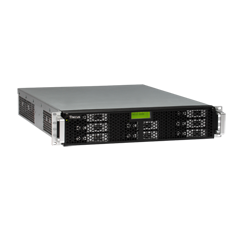 To manage all of this capacity, the N8800 comes with a number of advanced data management features, including multiple RAID modes (RAID 0, 1, 5,6,10, and JBOD are supported), hot spare, hot swap, and auto-rebuild. And with its dual Gigabit Ethernet ports with load balancing and failover, users will always have access to their data. Every organization is different. That's why the N8800 has been designed with flexibility in mind. The N8800 is fully compatible with all major operating systems, including Windows, Mac OS, and Linux. Users can access data via a number of common protocols, including SMB/CIFS, HTTP/HTTPS, FTP, NFS v3, or AFP. 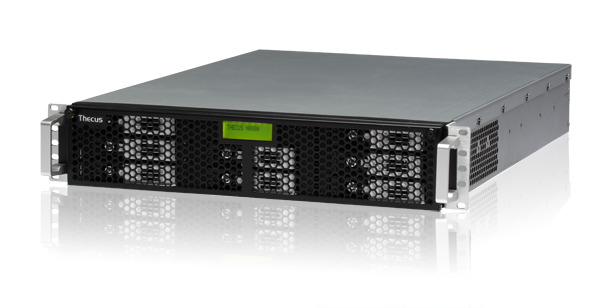 The N8800 even offers support for ext3 and ZFS file systems for enhanced compatibility with existing networks. The N8800 comes equipped with a plethora of useful features, including ISO mounting and support for web servers and MySQL. Connect IP cameras to the N8800 and it can even be used as a surveillance server. The N8800 also supports external modules that can extend the functionality of the N8800 even further. The N8800 can be the IT manager's best friend. Automate backups with Thecus' proprietary Nsync remote data backup application, or take advantage of version control via a snapshot function using the ZFS file system to create and restore remote backups. The N8800 can be set up to send email notifications of any system abnormalities to the system administrator, including if the system is forced to use the redundant power supply. IT support is tough enough. Why not choose a storage system that tells you when something is amiss?